What time is it? Disclaimer time! Tom Francis used to work for PC Gamer. Also, a portion of PC Gamer UK went to his house on New Year's Eve. Also, we were all at the pub the other night, where he told us, among other things, that he was going to do an absolute beginner's guide to Game Maker. Here's the thing, though: it's January 6. Nothing interesting is happening. So I either write about this—a cool and potentially helpful thing that a game developer is doing—or I tell you how much money Kickstarter has received in total over the last year. Do you really care how much money Kickstarter has received in total over the last year? Because I don't. 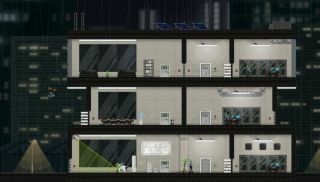 Gunpoint creator (and... well, see above) Tom Francis is making a tutorial series showing absolute beginners how to make a game in Game Maker—the tool used to make both Gunpoint and Francis's upcoming Heat Signature. The first episode was released yesterday, and you can see it below. Tom's own disclaimer states that this isn't a great series if you're looking to be a top programmer. Instead, the point is to show you how to make a game with absolutely no experience, and in the easiest way possible. As he puts it in the video, "once you get something working, you will know if making games if for you." I imagine for many it could prove a useful resource. One of the big barriers to game development seems to be the first step: actually realising that it's possible to just start making a game. Having someone talk you through that—showing people that with a little effort they can make something—strikes me as useful. You can find future videos over on Tom's YouTube channel. Previously, while working for PC Gamer, Tom talked to a bunch of indies about their own preferred game making tools. We've also talked to a selection of indies—Francis included—about the smash hit games being made with Game Maker.